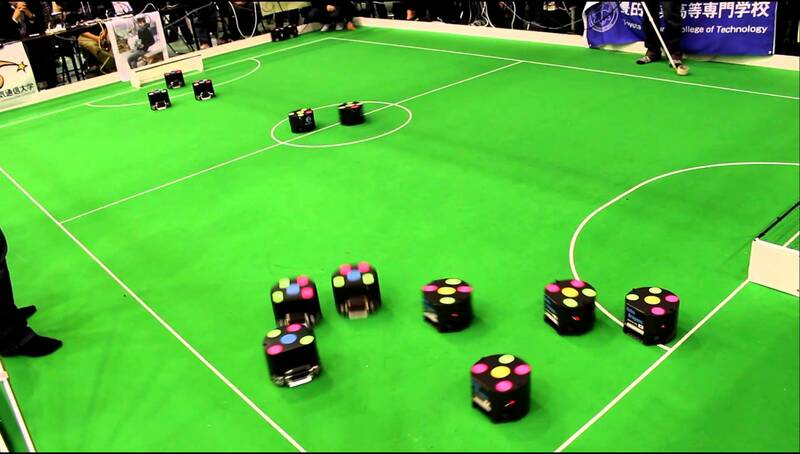 A Small Size robot soccer game takes place between two teams of six robots each. The robot must fit within an 180mm diameter circle and must be no higher than 15 cm. The robots play soccer with an orange golf ball on a green carpeted field that is 6.05 m long by 4.05 m wide. All objects on the field are tracked by a standardized vision system that processes the data provided by two cameras that are attached to a camera bar located 4 m above the playing surface. The vision system (called SSL-Vision) is an open source project maintained by the league’s community. Off-field computers are used to communicate referee commands and position information to the robots. Typically, these computers also perform most, if not all, of the processing required for coordination and control of the robots. Communications is wireless and typically uses dedicated commercial FM transmitter/receiver units. CHALLENGE: The Small Size League focuses on the problem of intelligent multi-robot/agent cooperation and control in a highly dynamic environment with a hybrid centralized/distributed system.